Like a lot of modern buildings, Reading University has a lot of glass! It looks great. But it does have it’s problems. 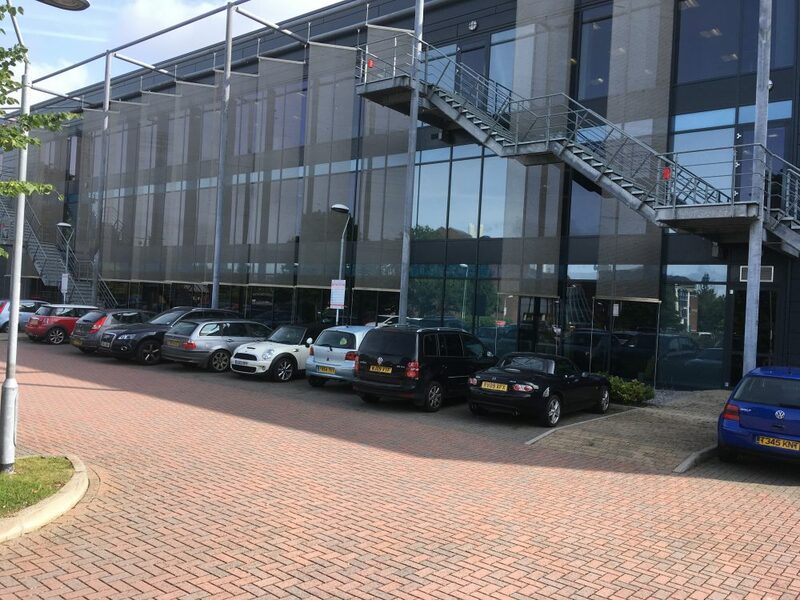 Reading University’s Enterprise Building had it’s tenants complaining for ages about the excessive heat and glare passing through their floor-to-ceiling glass windows – making the working environment very uncomfortable and difficult to function in. We’ve said it before, and I dare say we’ll say it a few more times, …. Research has shown that when heat and glare go unchecked in the workplace productivity slumps and the risk of accidents goes up. The University’s Construction Consultant carried out a number of tests and modelling of solutions and – voilá – came up with window film as the best way to solve the problem. In particular 3M’s new Prestige 40 technology – which has no metal content and allows a lot more visible light into the building – whilst still reducing the heat by over 50%. Installed externally and carrying a 10-year manufacturer warranty it was seen as the perfect solution to the buildings issues. The University then put the film requirement out for tender and Durable were chosen for the project. 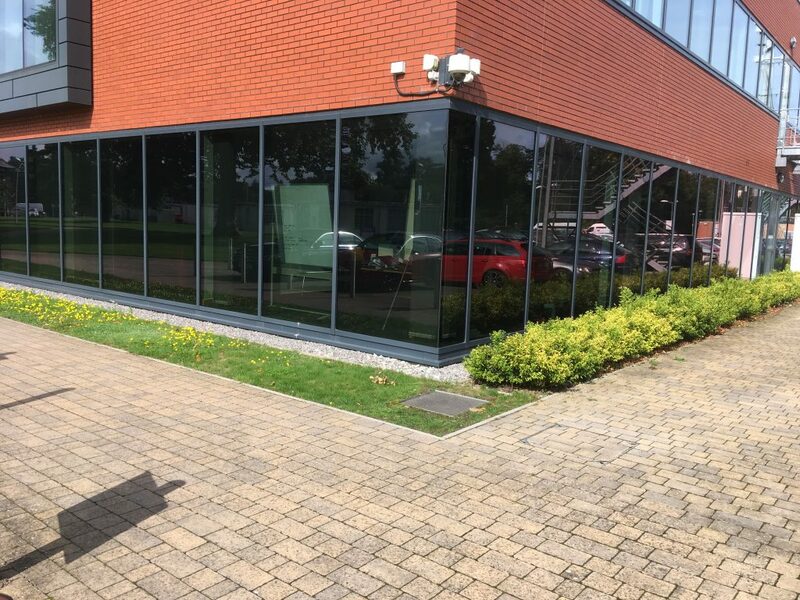 This was not only down to our usual competitive pricing, but also because of extra advice we could give them concerning the building – such as where areas already had an adequate external grade film applied. “Why not leave that for a while and look at other areas within the building that are causing a problem?” we said. They agreed. “Makes sense” they said. The original brief was for just the front elevation and two ends on block A – but the heat and glare issues were also very extreme on block B along two elevations of the ground floor. So with brilliantly competitive price AND added value and advice, Durable prevailed winning the tender. The work was carried out swiftly, completed on time, and within the original tendered price – including the very complicated scaffolding required to work around the strange ‘Brise Soliel’ on the front of Block A.
It’s like – if we were a super-hero, we’d be ‘Window Film Guy’ – changing into our costume in phone boxes (if you can find one nowadays – and it would have to have Privacy Film fitted for modesty of course) and saving the world and stuff. Well, maybe not saving the world (that’s Bruce Willis’s job anyway) but fixing solar control issues anyway. Which is still pretty awesome. You don’t see Spiderman installing window film do you? Come to think of it we are actually more like the A Team. If you have a problem, and you can find us – then you need the A Team. Don’t be a crazy fool.